Nissan Motor India Private Limited (NMIPL) is an Indian subsidiary of Japanese automobile company Nissan Motor, which is one of the largest car manufacturers of the world. NMIPL started its Indian operation in 2005 with the launch of their Nissan X-Trail (T30). The manufacturing plant of Nissan India is situated in Chennai, where yearly 200,000 vehicles can be manufactured. However the after the completion of the full plant, Nissan can manufacture up to 400,000 cars from there, which will be sold to more than 100 countries across the globe including countries of Europe, Middle East and Africa. Nissan Motor India Private Limited is selling several models of their cars in India, among those, few are manufactured in India and some are imported from Japan as completely built units. Our website is dedicated to offer cheap and 100% genuine Amaron, Exide and SF Sonic batteries for several models of Nissan cars available in India, which includes models like Micra, Teana, Sunny, X Trail and 370Z. 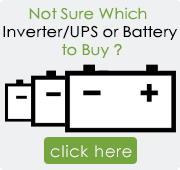 Here you can also compare price of the batteries and purchase according to your choice from our wide gamut of collection. We also provide free home delivery and installation services for your convenience.